A key parliamentary group which looks at protecting the best interests of hill farmers is being re-instated by the National Farmers' Union (NFU) and local MP Tim Farron. The group, which Tim chaired for ten years, disbanded back in 2015. But now, with the uncertainty surrounding Britain's future relationship with the European Union and the Government's radical new Agriculture Bill, it is felt that a group is needed now more than ever to stand up for hill farmers. The all-party group will host an official re-launch later this month where they will publish a report on the future of hill farming in the UK. 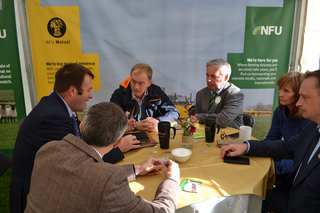 Tim said: "I've been delighted to work with the NFU to get our cross-party group back up and running. "With the Government planning to remove direct payments which are a lifeline to so many hill farmers, and with the threat of leaving the European Union with no deal still on the table, the future for hill farming has never been more uncertain. "That's why it's vital that there is a group in Parliament to speak up for the interests of hard-working British hill farmers who are so crucial both to the national economy and to the environment. "I look forward to working with MPs from all parties, and the NFU, to help secure the most stable future for the industry and a better deal for farmers here in Cumbria and across the country."